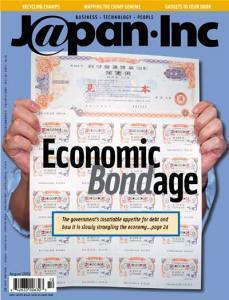 On the cover: 1 billion yen worth of government bonds are held up by a helpful Ministry of Finance official. The eMac is out!!! ... and nobody cares. Give your dog a "Beckham cut"
Online 'zine Shift keeps the design world connected. Craig Mod reports. Two Americans have what it takes to keep vintage wines on Tokyo tables. Elvis may be back from the grave to top the hit parade but the Japanese love the Beatles more. Robots take to the pitch in Fukuoka. Roll up, roll up -- get the best of Japanese technology fresh to your door today. Humans and apes have a lot in common, including much of their genome, but why are Japanese scientists racing to unravel the simian gene? Sara Harris explains. Western credit rating agencies say Japan's government is addicted to debt, but the bureaucrats are fighting back, claiming the ratings are way out of line. The J@pan Inc editors search for economic truths amid the mudslinging. As recycling laws restrict Japanese tendencies to dump unwanted goods, more small enterprises are finding ways to profit and prove that muck = brass. Smartcards are about to bring us more than just travel passes. Part two of our special report. What's keeping e-government bogged down? Strap hanging delays, trustworthy foreigners and the best of the US in Japan.